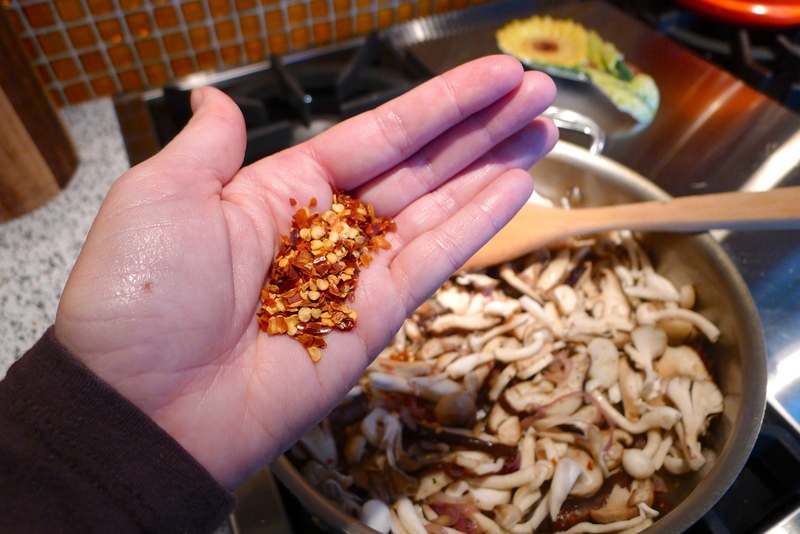 A couple of weeks ago, I made a wild mushroom pasta. 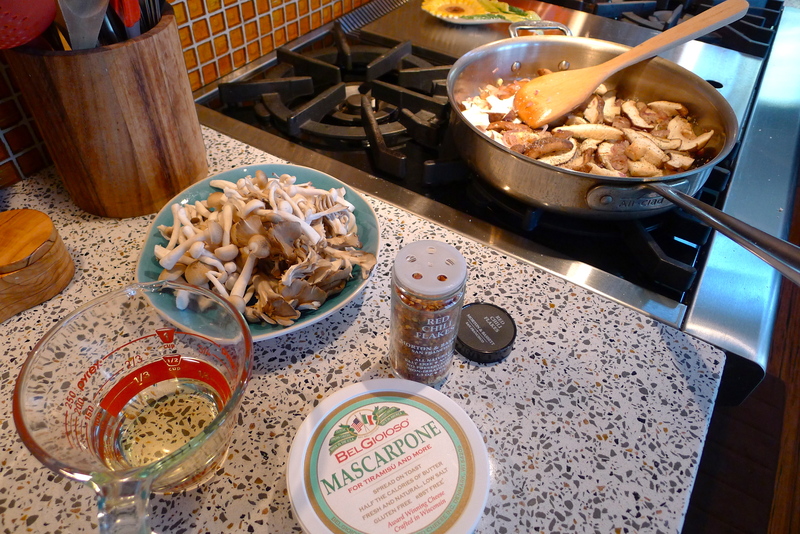 I didn’t follow a recipe and kept it pretty simple with garlic, shallots, white wine, and mascarpone cheese. John claims it is the best pasta I’ve ever made! It was scrumptious, if I do say so myself. 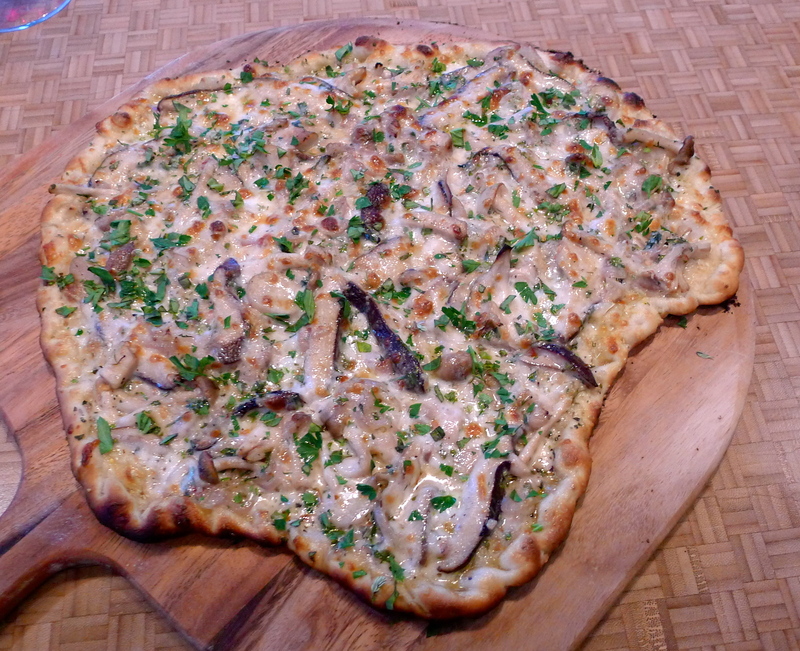 It was his idea to turn this fungi fusilli into a fungi flatbread. 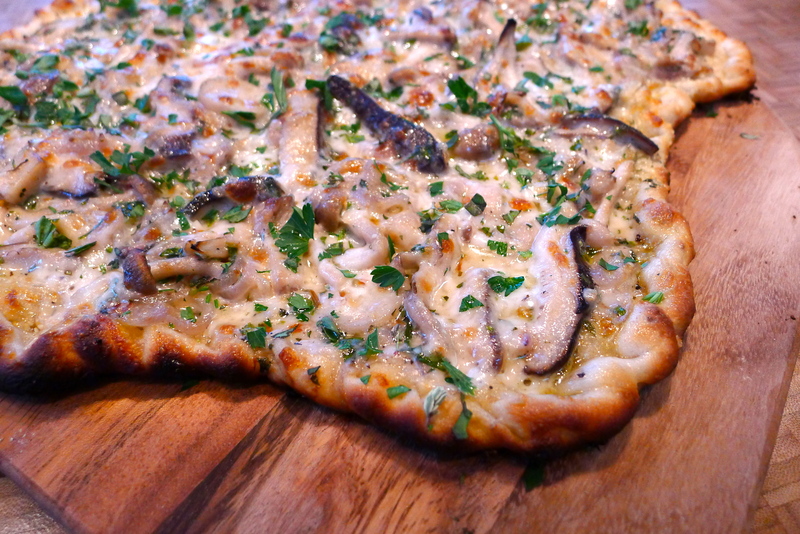 We’ll put anything on a pizza, and I figured the mushroom sauce for the pasta would work right on a pizza crust. I love taking one kind of food and applying it to something completely different (like Mexican pizza or Thai tacos). So we tried it! 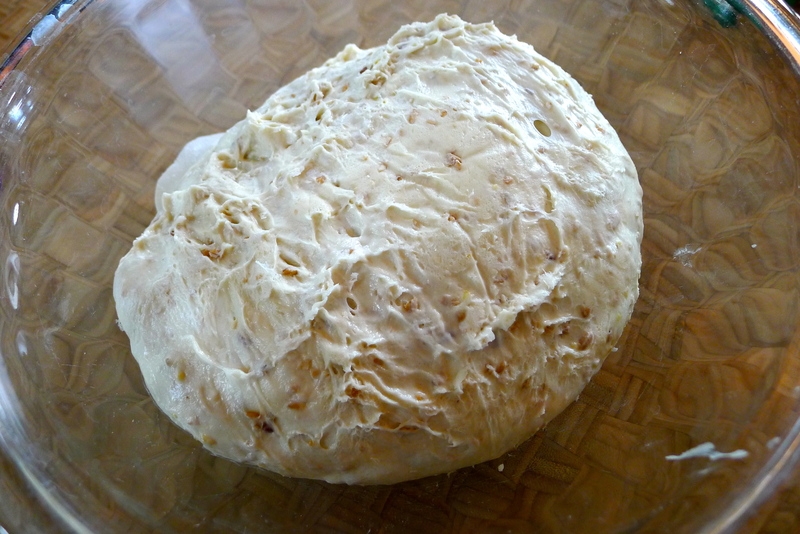 We’ve been using Whole Foods wheat pizza dough all summer. 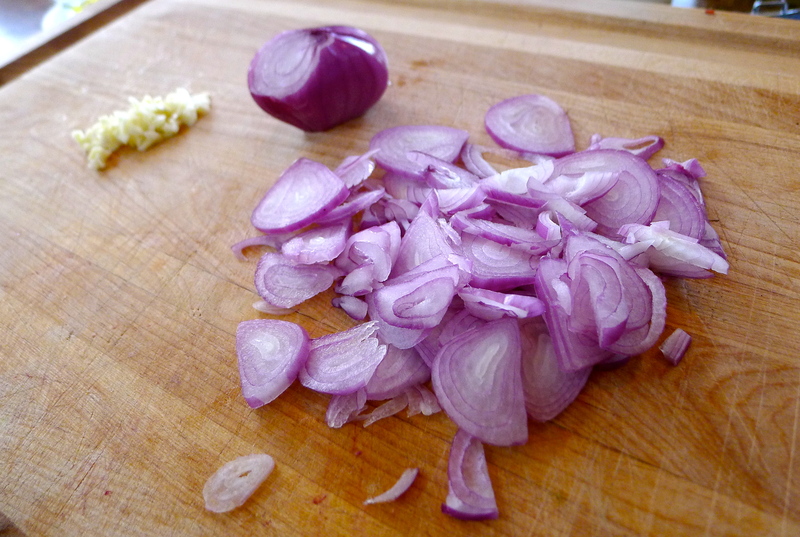 While it was rising in a bowl, I started by roasting a head of garlic. 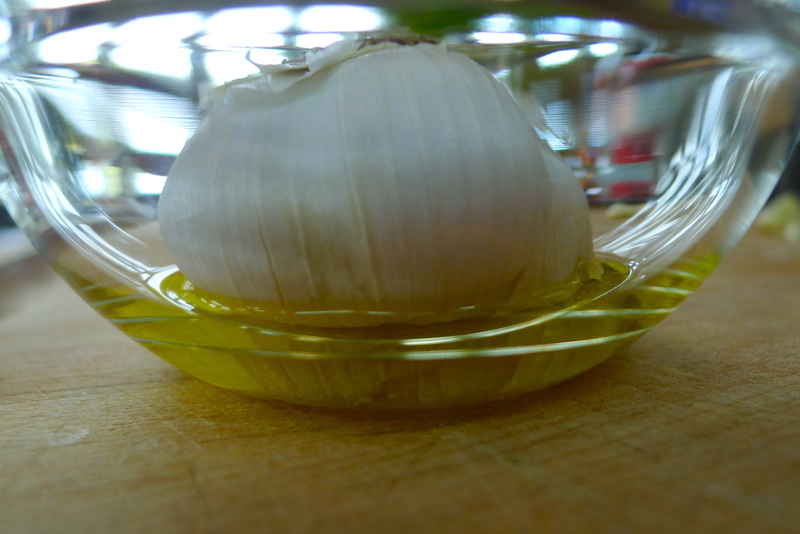 Roasting garlic makes it buttery and brings out a sweetness that is delicious. 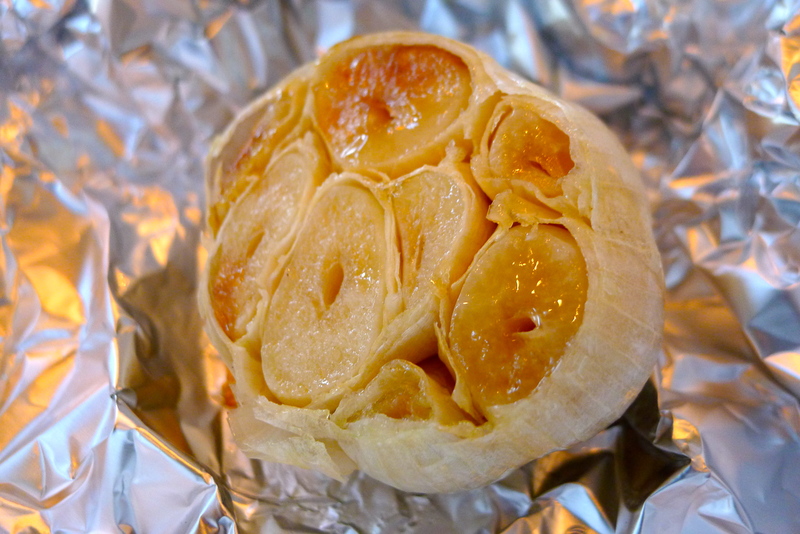 I cut off the top of the head of garlic, dipped the cut side in olive oil for a while, then wrapped it in foil and let it roast for about 25 minutes in a 450 degree oven. 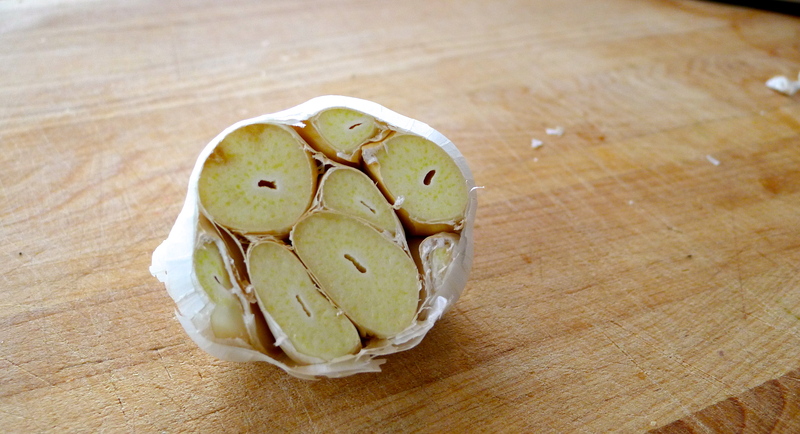 When it’s done, the garlic cloves are soft and can easily be pushed out of the peel. Look at these beauties! 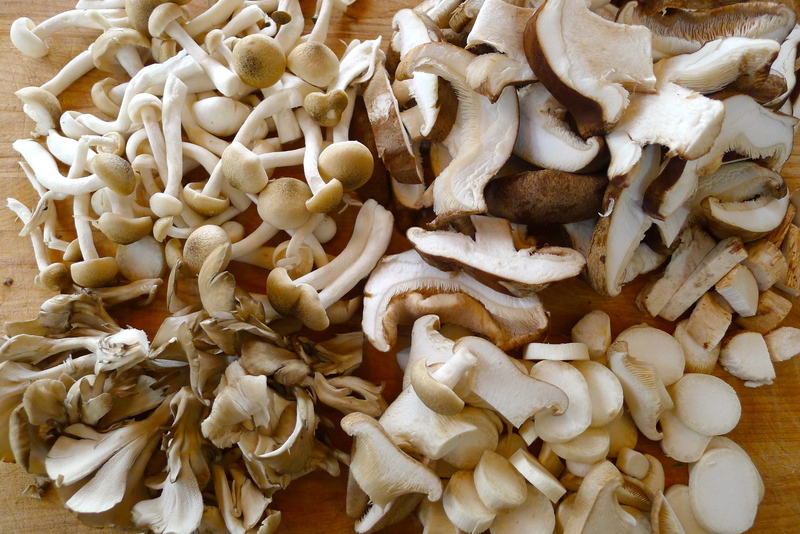 I chose a “Chef’s Selection” bunch of mushrooms that included clamshells, little enokis, maitakes, and king oysters mushrooms. 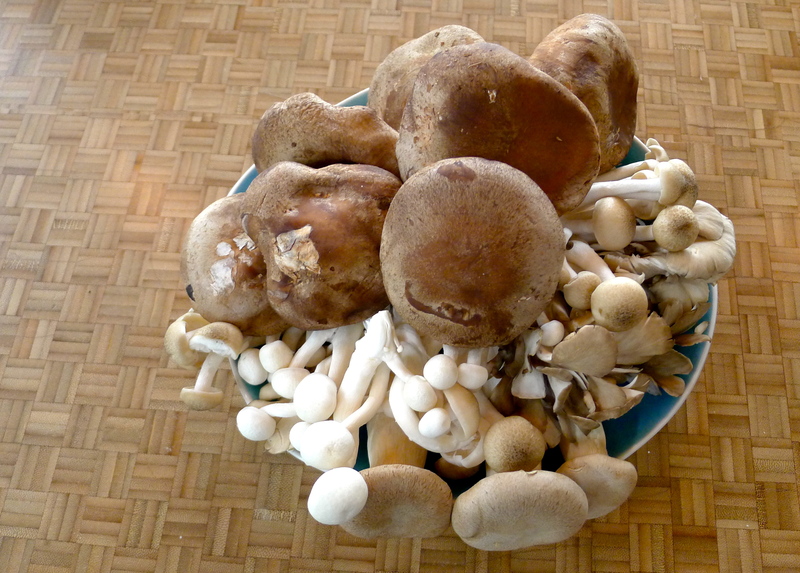 I added some big shiitake mushrooms to the mix. Any mushrooms would work; I like the differences in texture. 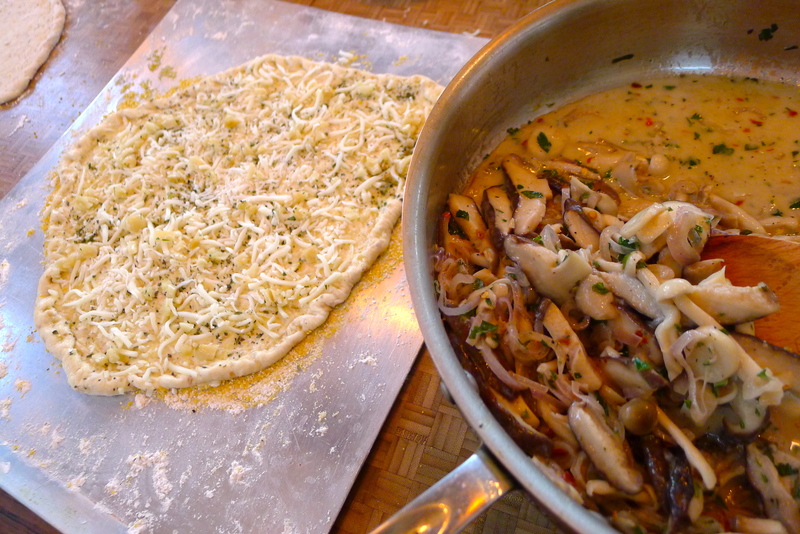 I chopped the bigger mushrooms into bite size pieces and sliced a large shallot while John prepped the pizza dough. 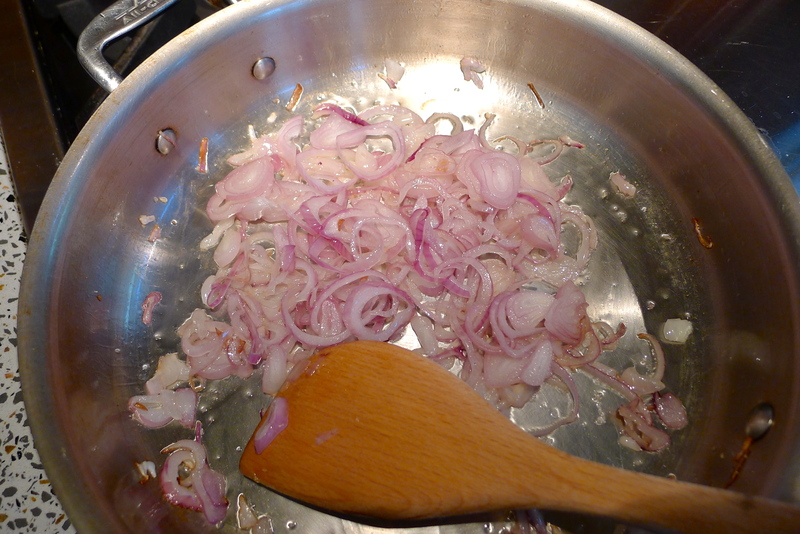 Just like I did for the pasta, I started by sautéing the shallots in a bit of olive oil. 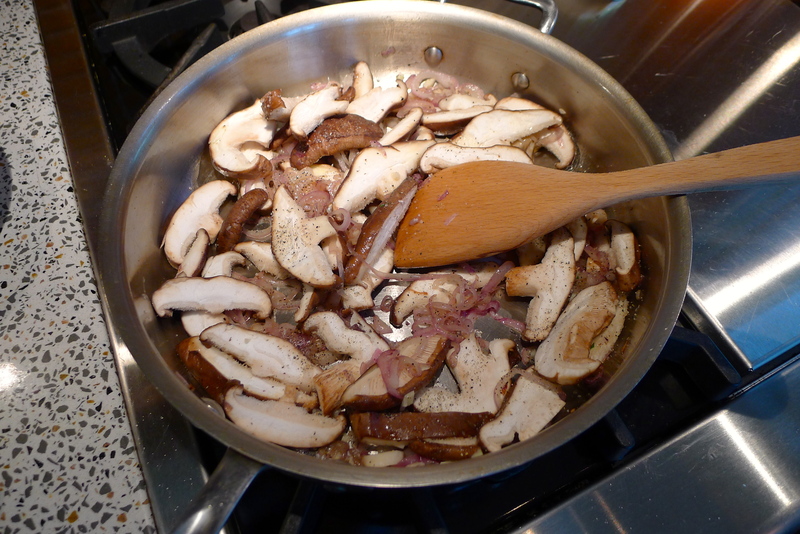 After a few minutes, I added the bigger mushrooms to the pan. 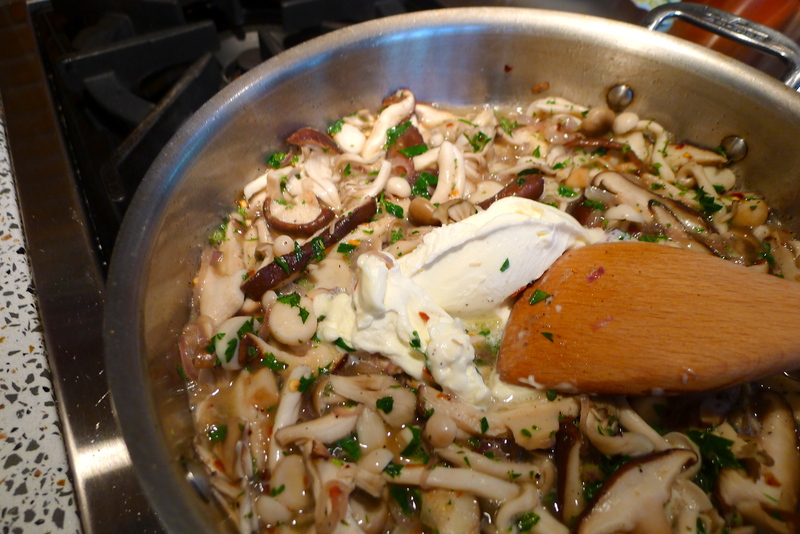 When those started to soften, I added the smaller mushrooms. I also sprinkled in some salt and pepper, a pinch (or two) of red pepper, and some fresh herbs: parsley, basil, and thyme. Next, I poured in a half cup of white wine to deglaze the pan. I added a big scoop of mascarpone cheese and a big handful of freshly grated Parmesan cheese. Let’s make a pizza! 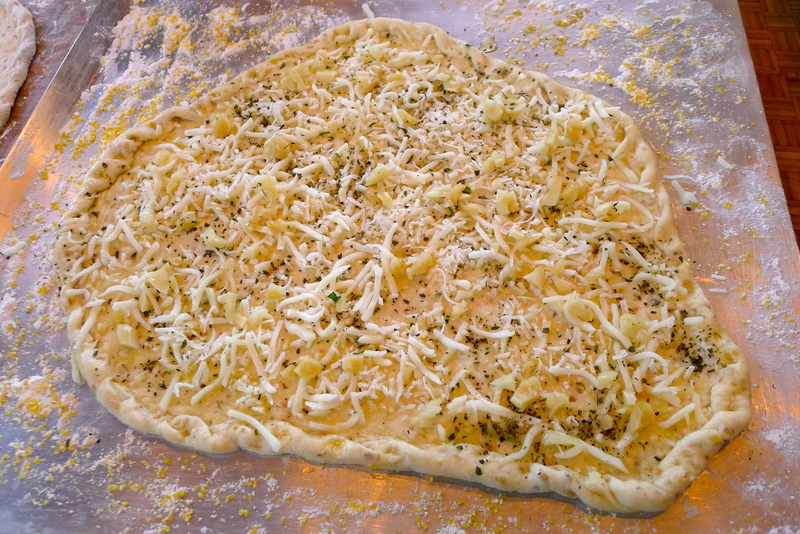 After brushing the entire crust with olive oil, I sprinkled a light layer of mozzarella cheese. I also added some dried oregano. 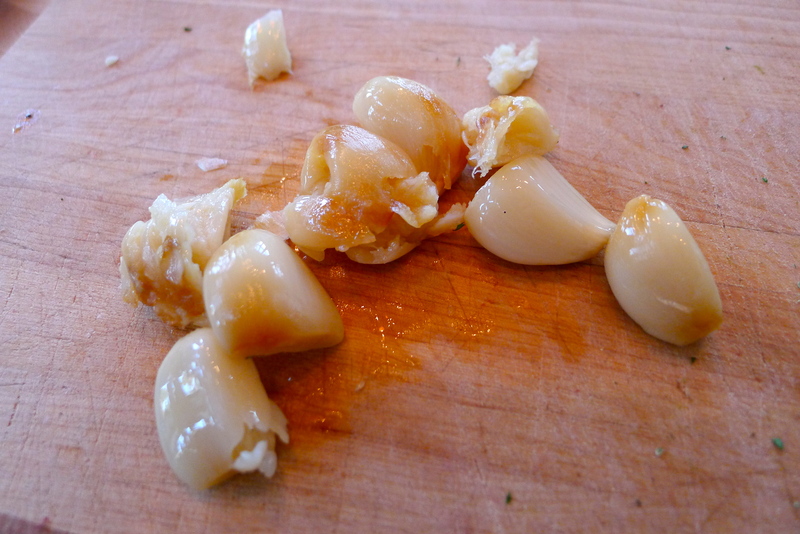 Next came the roasted garlic. 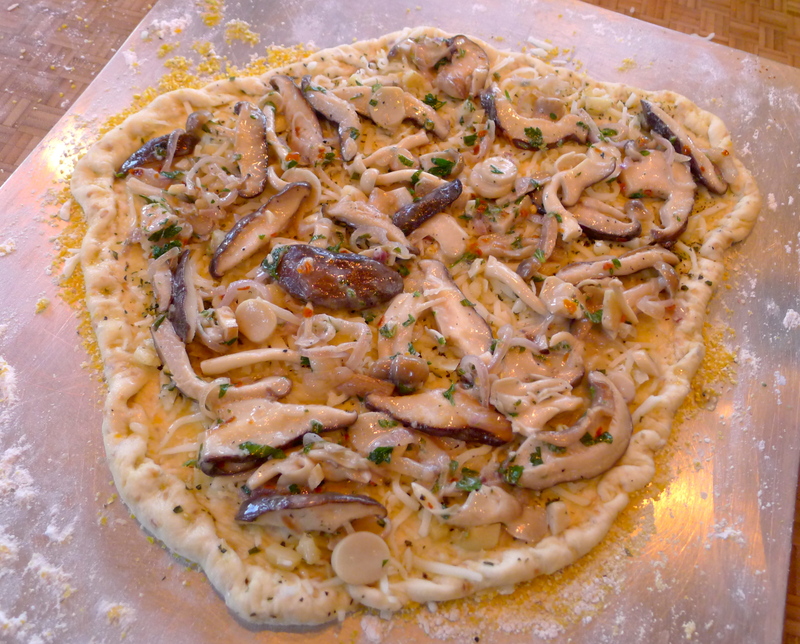 I scooped some of the creamy mushroom mixture over the crust and spread them out evenly. I topped the pizza with more mozzarella and Parmesan cheese. 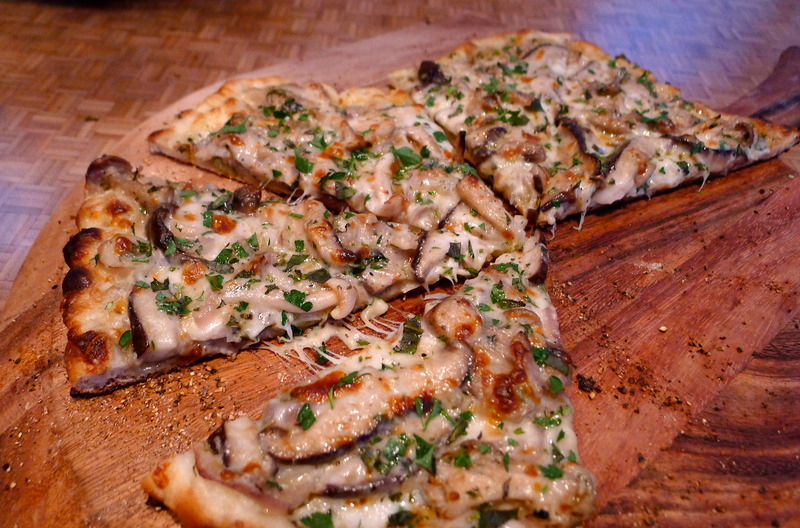 Pizza on the grill takes less than 10 minutes. The edges of the crust were perfectly browned. 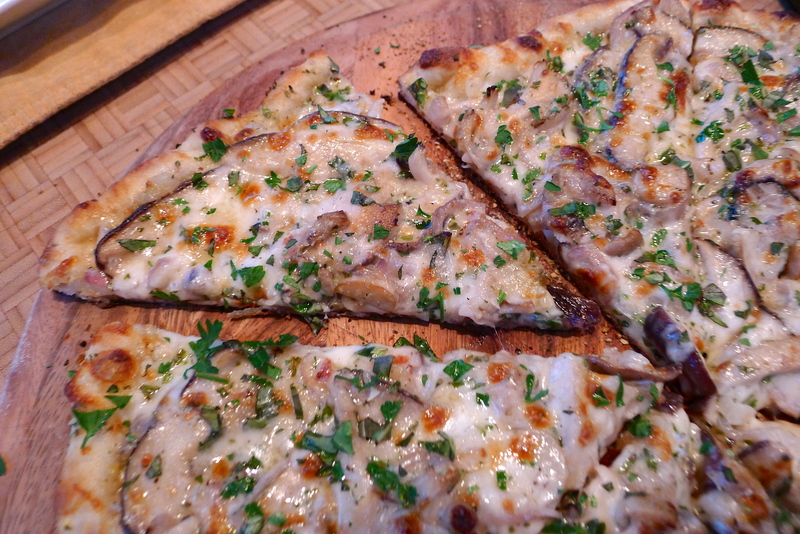 Before serving, I sprinkled more herbs over the top of the pizza. YUM. In the end, John was right. 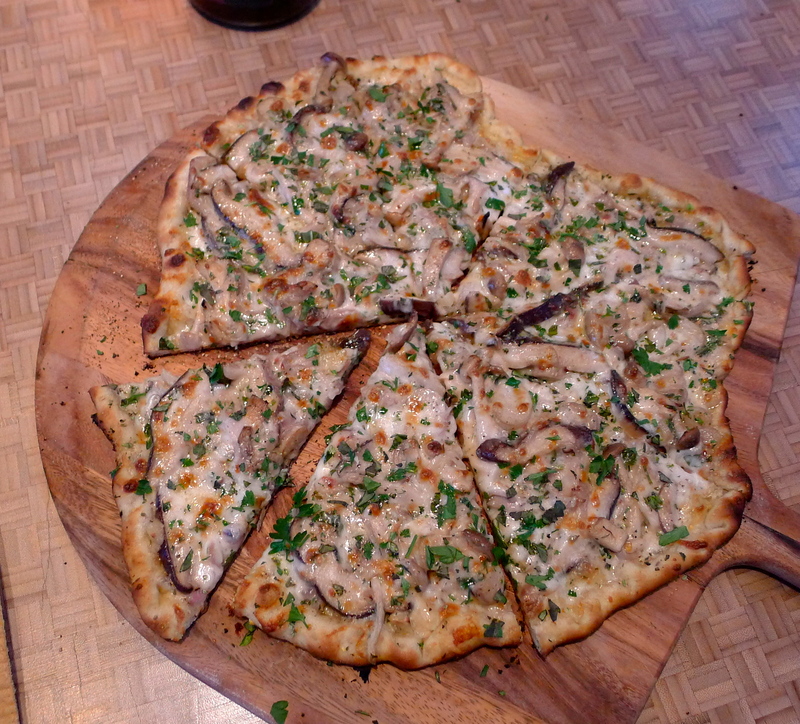 The wild mushroom pasta made a fantastic wild mushroom pizza. 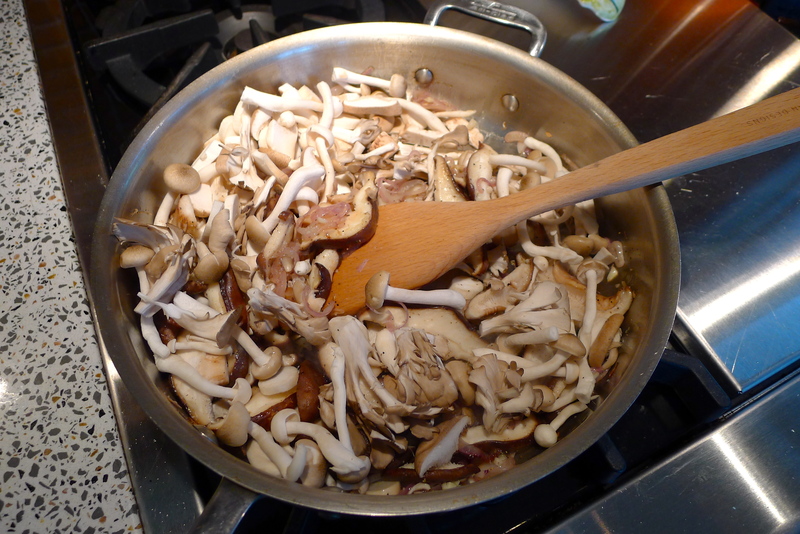 The mushrooms have so much flavor and texture and I love that you can see all of the different types. 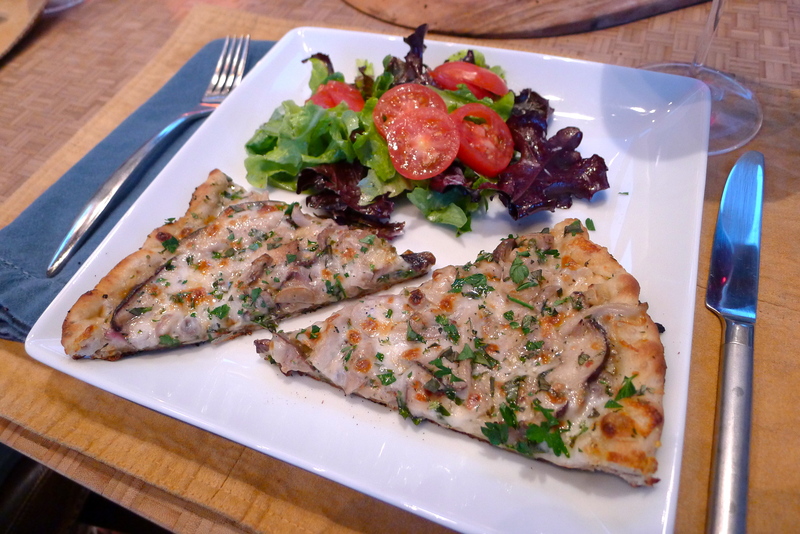 The mascarpone cheese lends a bit of creaminess and tang and the herbs freshen everything. 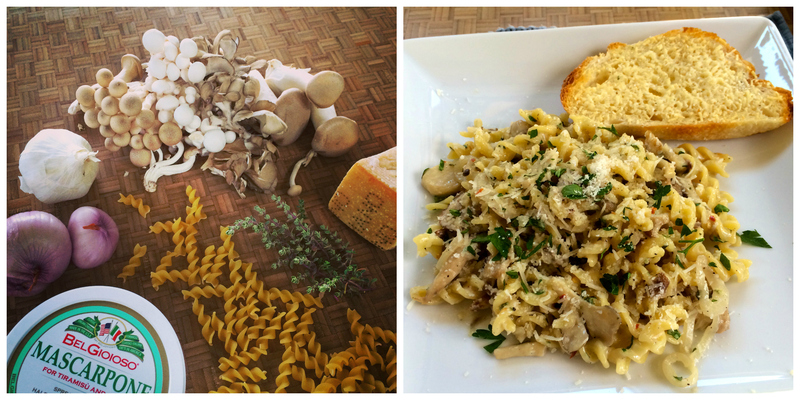 This recipe is perfect for this time of year as we embrace fall flavors. 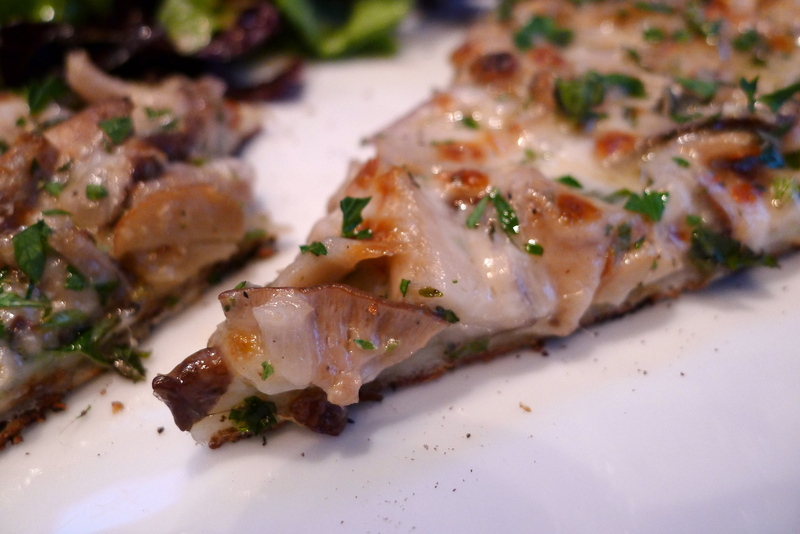 It proves yet again that just about anything can top a pizza and be delicious. And this recipe will leave you with leftover pizza for breakfast. Is there anything better? Heat a pizza stone on a grill at 500 degrees (or in the oven at 450). 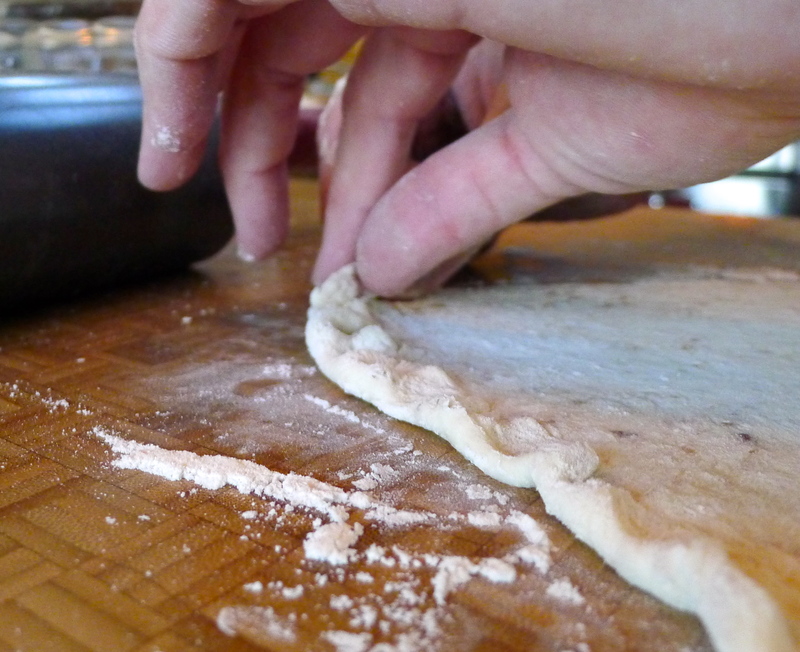 Generously flour the counter, cut the ball of dough in half, and roll the dough into a thin crust. 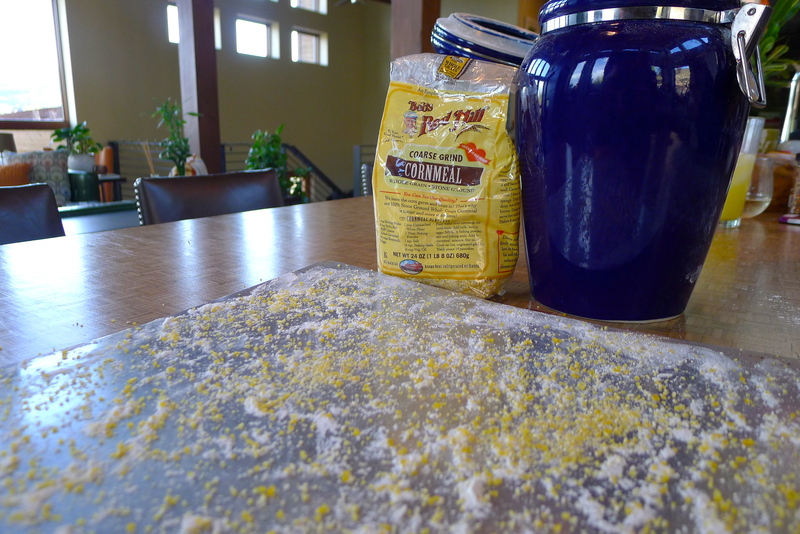 Transfer the crust to a sheet pan that has been dusted with flour and a lot of cornmeal. 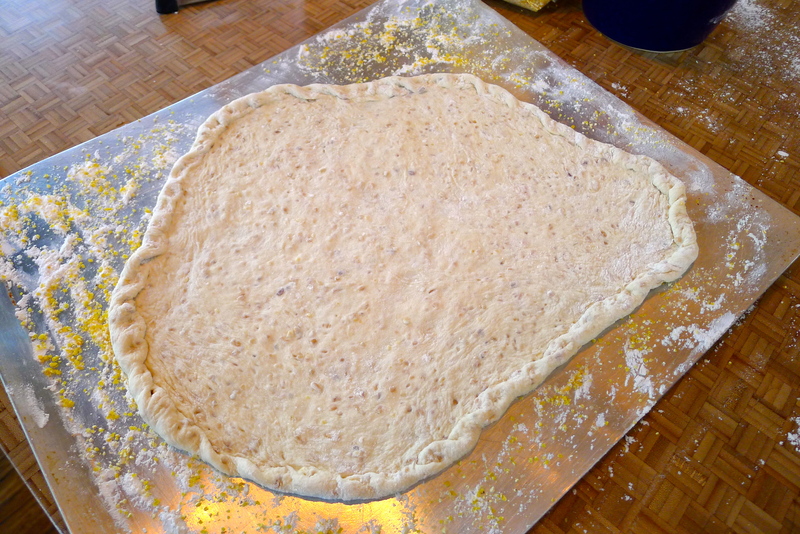 Crimp the edges of the crust. 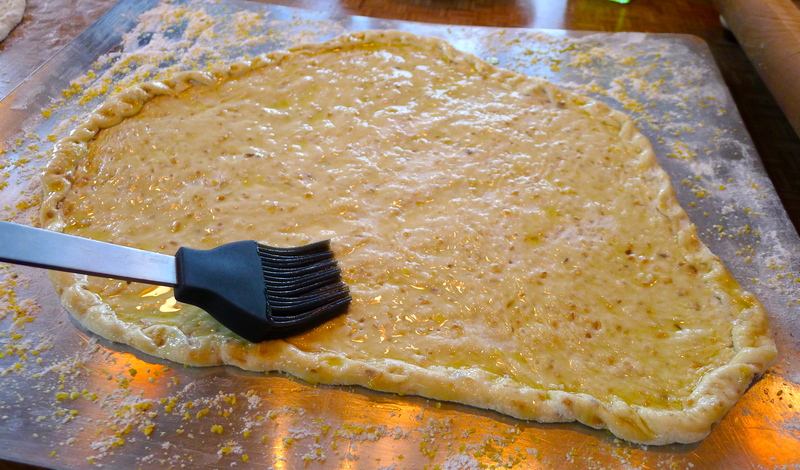 Brush the pizza crust with olive oil. 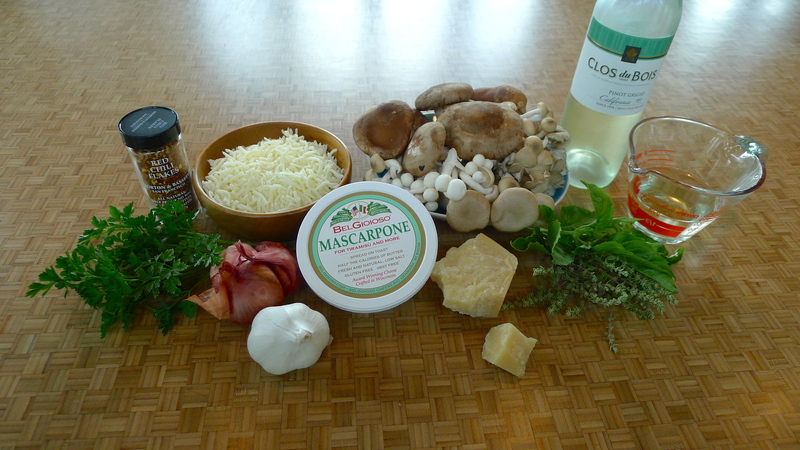 Sprinkle ½ cup of the mozzarella and half of the garlic. 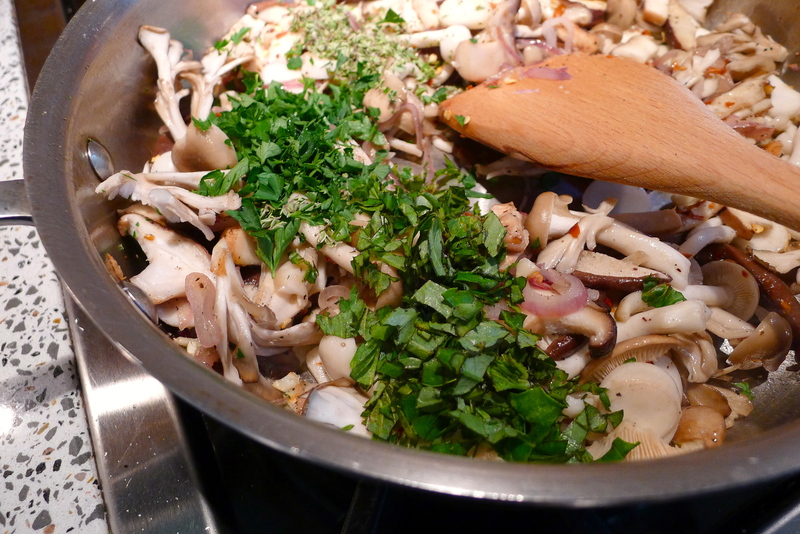 Add half of the mushroom mixture, spreading it evenly over the crust. 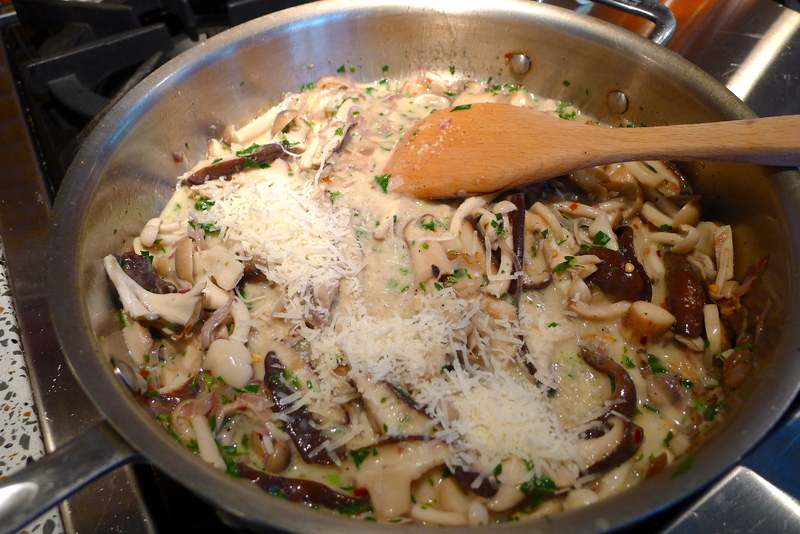 Top with another ½ cup of mozzarella and ½ cup of Parmesan. 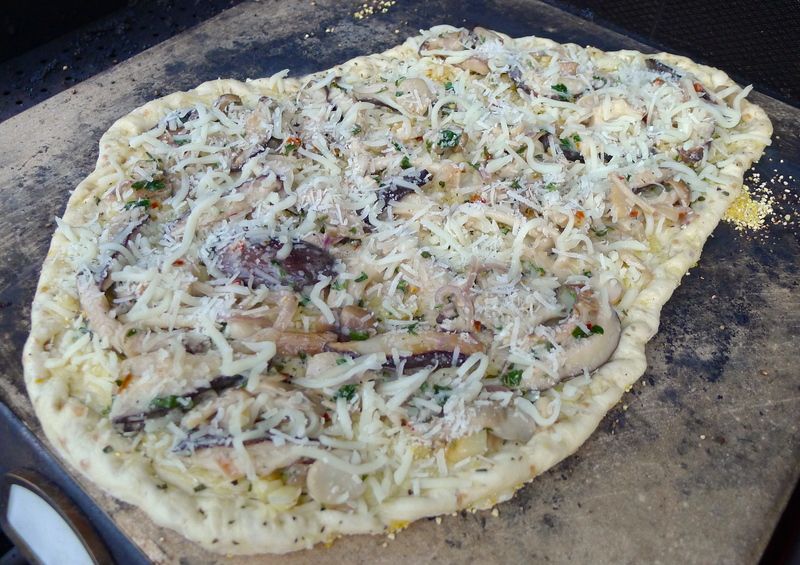 Slide the pizza off of the sheet pan and onto the pizza stone and cook for 7-9 minutes (watch it carefully- it happens fast). 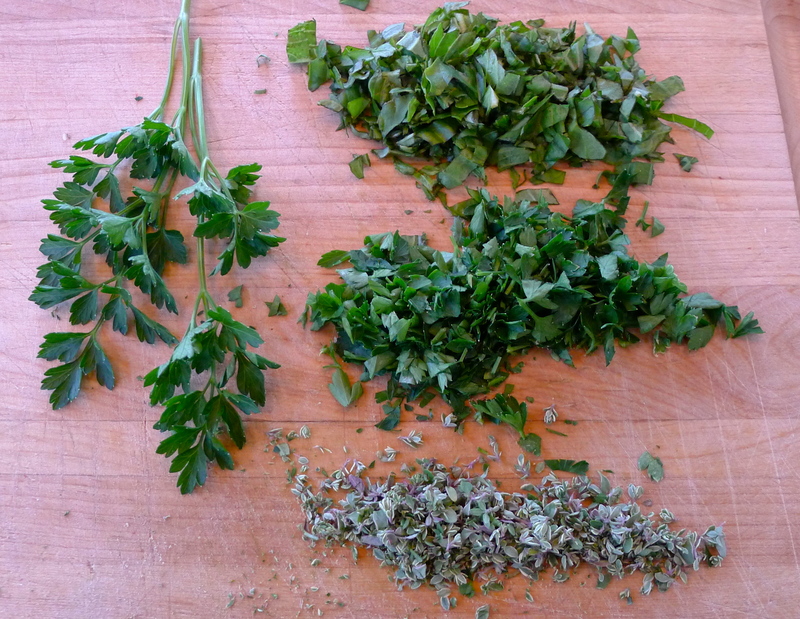 Sprinkle the remaining herbs over the pizza before serving. Repeat with the second crust because everyone loves leftover pizza. YUM. 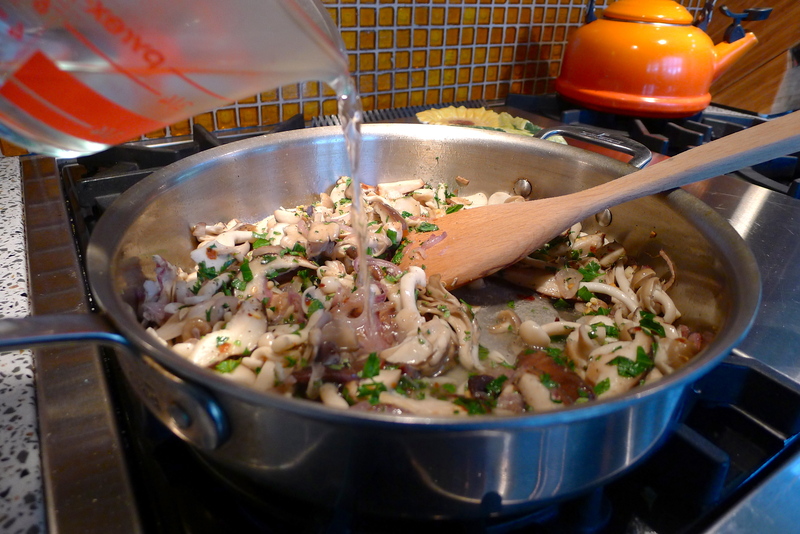 *To make pasta instead, this is where you would pour the mushroom mixture into a pot of drained pasta. Mix well and season to taste. 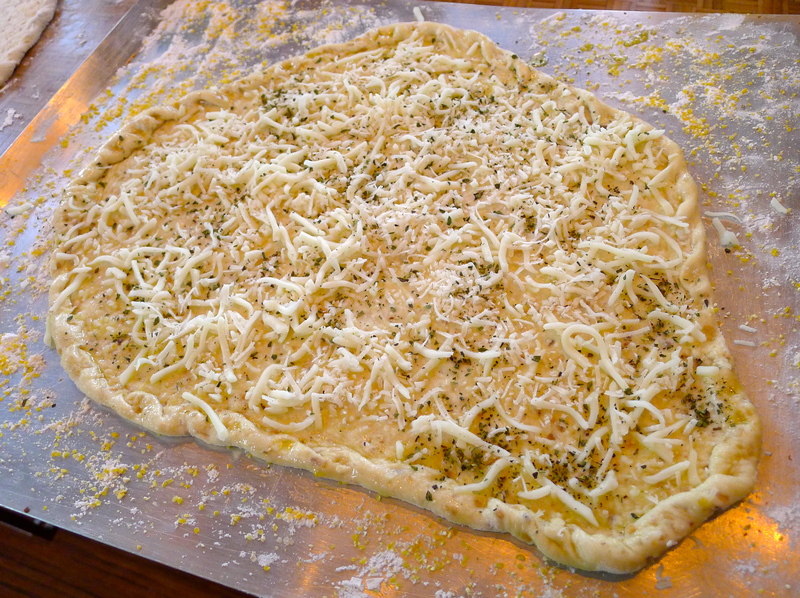 Top with Parmesan cheese and fresh herbs. Hungry for more? 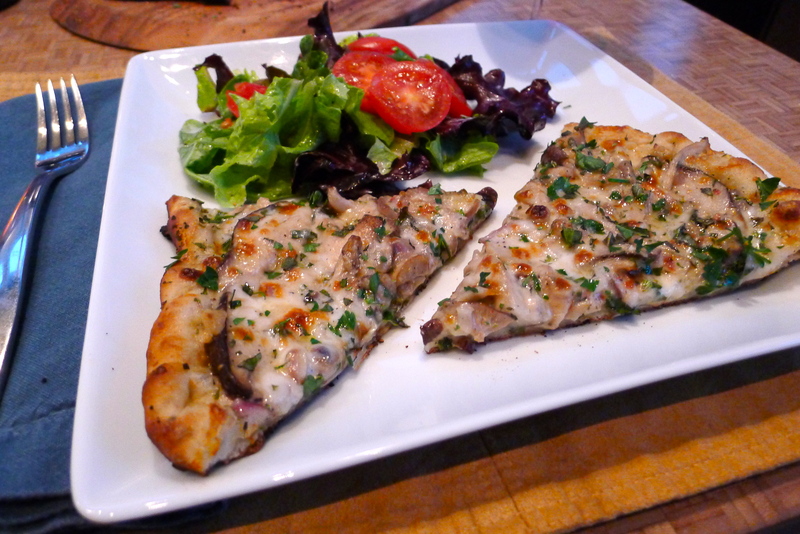 Other pizza recipes (and many, many more) can be found on the FOOD BLISS link. One year ago: A perfect fall camping trip to Aspen Grove. Drooling. 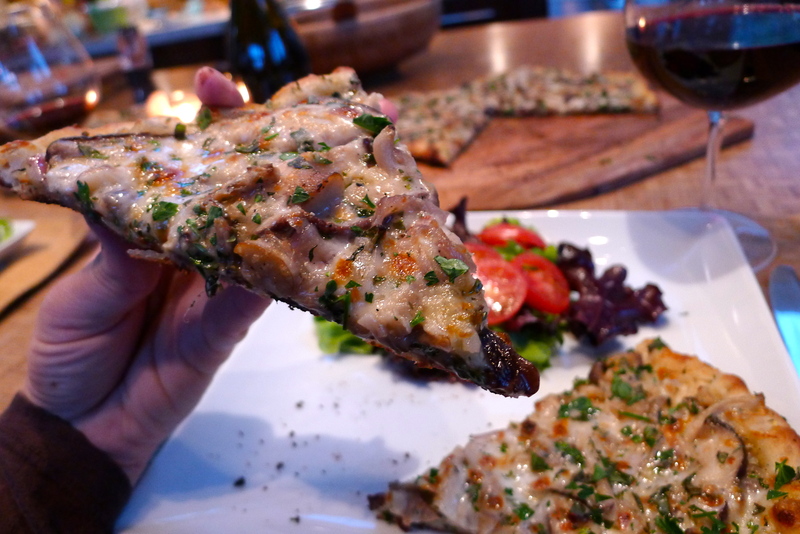 Grilled pizza is the BEST! 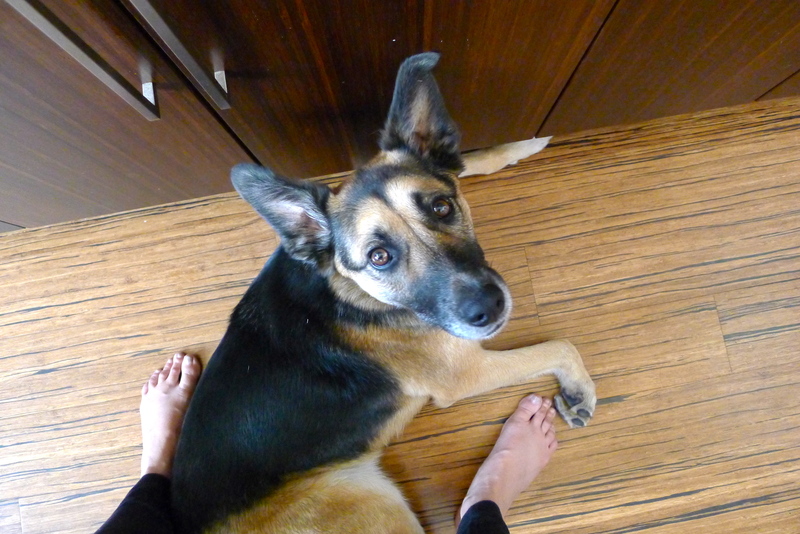 But we enjoy ours without the cheese — which is even better (my kids will say). When you use olive oil and garlic as a base, with fresh herbs on top, no less, it’s really easy to eliminate the dairy altogether.